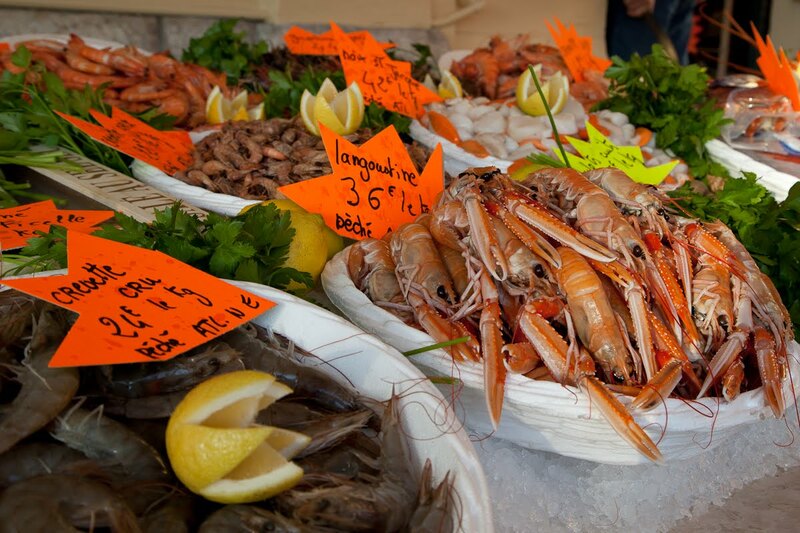 The French love seafood at Christmas - langouste, langoustines, prawns, scallops and of course oysters. 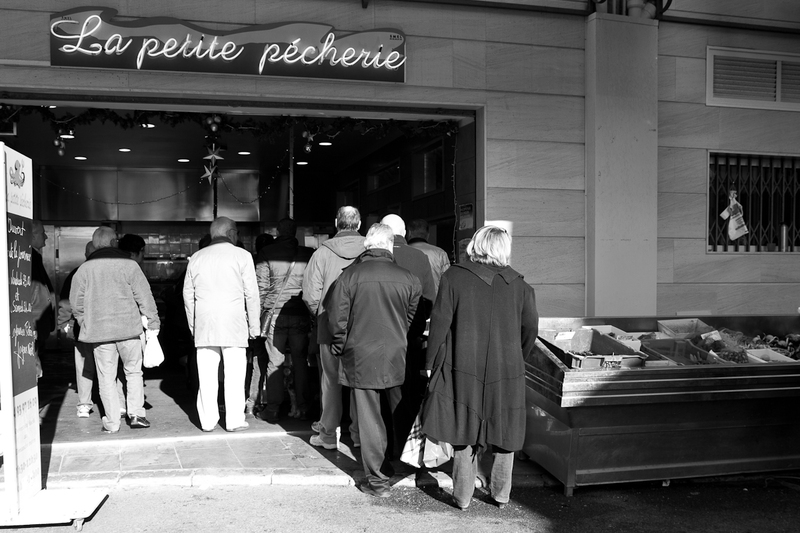 Menton's market positively overflowed with good things to buy on Christmas Eve and eventually long queues formed outside the various fish stalls and fish shops. Me...? I chose a dish of scallops and prawns. Delicious. I hope you had a wonderful Christmas Eve or Christmas Day dinner. What did you eat? 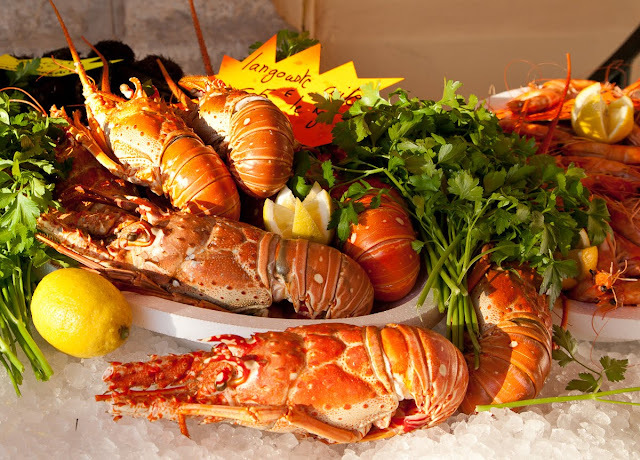 A Noël, les Français aiment les fruits de mer: langouste, langoustines, crevettes, Saint-Jacques et huîtres bien sûr. 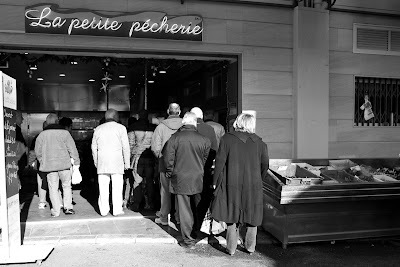 Le marché de Menton déborde littéralement de bonnes choses à acheter la veille de Noël et à l'occasion, de longues files d'attente se forment à l'extérieur des étals de poissons et des poissonneries. Moi ... ? J'ai choisi un plat de coquilles Saint. Jacques et de crevettes. Délicieux! J'espère que vous avez eu un merveilleux dîner pour le réveillon de Noël ou un déjeuner pour le jour de Noël. Qu'avez-vous mangé ? Superb still life! We had a pork roast with lots of sides and trimmings. But I love seafood, and miss those little 'crevettes grises' I used to munch on. What can I say? It looks beyond delicious. I'm salivating. We had artichoke dip, New Zealand boneless leg of lamb with mint jelly, rice pilaf, roasted potatoes, Greek Salad, delicious desserts and red wine...but they all pale next to this wonderful feast you featured. What beautiful fruits de mer, Jilly. We have our feast on Christmas Eve. This year it was roast duck in orange sauce, cherry glazed ham, mashed potatoes, a casserole of green beans, mushroom soup and onion rings that is a classic Midwest comfort food, and Watergate salad. For dessert we had a Buche Noel and a checkerboard cake, and of course some Spritz cookies and cocoa for the little ones after we opened presents. Hah! Being the fruit-of-the-sea, I guess prawns can 'flower'. I would let this typo stand, as it complements the totally delicious photograph, Jilly. Sea-food is very popular here in Sydney, too. However, we had ham and turkey with roast vegetables and fruit-mince pies. turkey, salad, cranberry, asparagus. i'd love to know how you prepared your scallops. Brattcat, I didn't! I bought the dish in the market - scallops and prawns in a tasty sauce with parsley. Probably had a lot more in it but I don't know what. Just warmed it up and served with jacket potatoes and some lightly cooked veggies - courgettes, mushrooms, tomatoes. We had oysters and smoked salmon followed by a leg of lamb with 'pommes dauphine'. Then we had lettuce and cheese followed by tiramisu. All in all too much to eat but a wonderful atmosphere. Oh and I forgot to say how impressed I am with your photo. It could (should) go into an ad for a restaurant!